I tried to make my poster for the SAA 2013 meeting as unique as possible! It’s hard to believe, but the end of the fall semester is a good time to start thinking about next summer’s professional conferences. Though June, July and August might seem like ages away, many conferences use January as their deadline for submissions from students. So today is as good a time as any to talk about a type of submission that can seem foreign to a lot of library students- the poster session. Let’s dive in! At conferences, poster sessions are an opportunity for students and/or established professionals to present their work in an informal context. It’s a great way to dip your toe into the conference presentation waters. Unlike a traditional session, all of the posters are set up at once, and each presenter is expected to stand with their poster for the entirety of the session (typically an hour or two) to answer questions from passers-by. The advantage of this format is that it can be a lot less intimidating to be a part of than a panel or paper presentation. Also, at most conferences more posters are accepted than papers, especially from students. If you keep an eye on your listservs, or check the website of a particular organization you’re interested in, you will notice a lot of calls for posters. Here are a couple of examples- one from ALA and the other from the Society of American Archivists. The timing might vary- you could have six months or six weeks. But you know how these things go- you’re most likely to find out about the deadline a week or so before it’s due. DON’T WORRY. One of the secrets of conference presenting is that you typically only need an abstract of around 250 words at this stage in the game. So now it’s time to set your idea down on paper. Where’s this idea going to come from? You probably have something you’re already thinking about. It might be a paper you really enjoyed writing, or a collection you’re working with, or an outreach program you’re involved in. Or, you might have already done a poster for class. Go with that! It doesn’t have to be a brand new idea, just your take on it. The trick to writing an abstract that will get your poster accepted is to treat it like an advertisement- you want to explain what the topic is, but also convey why you find it exciting and why the reader should too. After you submit your proposal begins the waiting game- this is a good time to flesh out your idea with more research. I got accepted! Now what? That’s great! Now’s the time to go back to the conference website and see what the requirements for your poster are. READ THESE CAREFULLY- each conference is different. While many use a standard 36×42 poster, others may have more unique size or material requirements. The posters at ALA need to be 4×8 feet! The website should also tell you what the schedule requirements are- how long you should be there, how much time you’ll have for set-up and tear-down, etc. You’ll also find whether you will have access to power supplies, or tables to A/V equipment, etc. One word of warning- if you do use something electronic, you need to plan ahead for glitches. Be prepared with analog materials if the technology fails. What sort of formatting should I use for my poster? Again, this can depend on the conference. A Google search will reveal lots of examples of posters, but I particularly like this site as a source for templates and structure ideas. On the other hand, don’t feel constrained by tradition! As long as you meet the conference requirements and get your points across, the sky is the limit. You want your poster to be both visually appealing and informative. Font sizes are important- you want your information to be visible from a distance of two or three feet. You want to use at least 16 point. Also, keep in mind that people don’t want to read an entire paper off your poster. Keep your text succinct and necessary. Use a hand out or direct visitors to a website if there’s more to the topic than what the poster can hold. Sometimes your topic can inform your format. 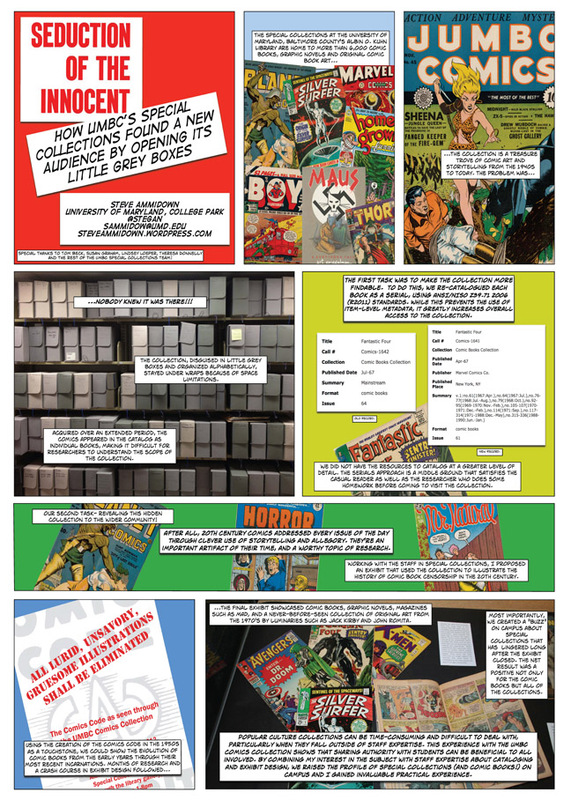 The poster I presented at the Society of American Archivists meeting this year was a case study about a comic book collection, so I made it look like a comic book page using ComicLife for Mac. It certainly got attention! If you’re particularly comfortable with Powerpoint or Publisher, those can be put to use. Personally, I’d rather use a product like Photoshop or InDesign. What’s key is to not go too far outside your comfort zone with software- you want to be focusing on the content and design, not wrestling with a totally foreign software package. It’s important that whatever you use can save your poster full size in PDF form, just in case for some reason you need to print it again. Oh, and printing! Make sure to call around and make sure whatever print shop you’re going to go to can handle the size you need, in the timeframe you need it. More schools are making large-format printers available in spaces like learning commons- this is what I ended up doing because of time constraints. It’s a slightly pricier option, but you have (theoretically) more control over the final product. The day of your session, make sure you eat beforehand and have water nearby (after all, you’re going to be talking for a couple of hours straight in a loud space). Dress professionally, and have business cards handy. A lot of the people who come to see you may be the same ones who interview you after graduation, so you want to make a solid first impression. You’ll also want to have an “elevator speech” of no more than 30 seconds ready. Practice this. You want to briefly summarize your topic, but let the poster and your audience’s curiosity do the rest. And don’t take it personally if someone quickly moves on to the next poster- there’s a lot to take in at a conference. Take some time to walk around and talk with other presenters about their posters. They’re in the same spot you are so show them some support! As for the more practical aspects of conference attendance, I highly recommend checking out our Hack ALA series– while the tips are ALA-specific, many can be applied to any conference. Also be sure to read Brianna’s excellent post on presenting at conferences. Now it’s your turn- what else do you want to know about posters? Also, if you’re a Hacker who’s done a poster session, what was your experience? Share in the comments! I find so many posters are just huge blocks of text that make my eyes glaze over immediately. I want the visual aspect of a poster to also help tell me what I’m looking at. At the same time you don’t want a fun graphic design keep you from including content or make it feel scattered. I felt it really helped me to think of conveying the idea visually/graphically hand in hand with what information I wanted to include. Developing the two together helped me focus my content to work with how I wanted it to look visually, and to modify my look as I sorted through my content. Keeping both in mind kept it looking coherent, while it was very clear what my subject matter was just from a quick glance. Thanks for sharing! And your point about balance is so important. It’s so easy to end up with a poster that’s either too dense or too flashy. Which makes me think of another good idea- make sure to have other people look at it while you’re going through the design phases. What looks well-balanced to you might look way off to someone with fresh eyes. At one point in my design process, I was absolutely trying too hard to be visually interesting. And I didn’t really notice how overwrought I’d gotten until someone else look at it. In addition to business cards, I’d also suggest a small handout with the poster name, your name(s), and that gives some summary, takeaways, or ideas of what to do with the information they learned from your poster. If your viewers are anything like me, they may look back at a stack of business cards at the end of the conference and forget which person went with what thing. The handout connects the topic of the poster back to you, so if they have further questions or want a copy they know who to get back to. And, if they don’t, the handout will help them remember the most important bits. Good point! For my poster at SAA, I decided to forgo the handout because I wasn’t sure it would add that much value in my case. I did come up with another way for people to remember me though. Great post, Steve! I am a big fan of poster presentations. They are a relatively straightforward way to learn how the conference proposal process works and gain experience talking about your project/ideas with colleagues. Your comic book-themed poster puts my relatively boring, academic posters to shame (some shown here: http://www.briannamarshall.com/portfolio/my-presentations/). Yes, bring business cards, and yes, bring handouts too. The setup for every poster session I’ve ever done has been different, though, so you may not have a table to place these materials on. I print my posters on campus at IU, where we have a plotter printer that is extremely cheap for students to use. Definitely do your research on costs because if you go to a standard copy shop it gets expensive fast. You make a great point that you really need to keep an eye out for calls for proposals early. Some small to mid-size conferences I recommend that other students present a poster at include LOEX (instruction/public services) and the Midwest Archives Conference. Don’t be intimidated by larger conferences like SLA, ACRL, ALA and SAA, either. My mindset was always that if I planned to attend a conference, I should at least present something at it to make the investment worthwhile. Posters are a great way to do that! One thing you don’t mention – and one of the big hassles of poster sessions (which I happen to enjoy presenting at and going to – see http://bit.ly/IsO9WR ) – is getting the poster to the conference. It’s a bit of a challenge. It’s not fun arriving with a messed up poster. I know some folks who wait till they get to the conference – and then they go to a local printer and get the poster made. I’m not sure I’d want to wait until the last minute to do that. So I’ve starting using postersession.com (not an endorsement – i’m sure there are other web-based poster services) – which helps to simplify both the poster development and transportation part of the process. They have the templates for different styles and formats so you can spend less time on design and more time on presentation and content. Then they can actually ship the completed poster to your conference hotel for the date you want it to arrive. The hotel will hold it for you. That way when you get to your hotel in the conference city your poster is all nice and neat (in a proper shipping tube) just waiting for you. Yes, it is more expensive than printing it out on a local printer, but the tradeoff is the time you save and the convenience. I found it eliminated a lot of the stress I dealt with in making posters locally and then transporting it.